Vintage One: 20 years of Mtn Bike passion and counting. : C'mon big brown truck. Good things come from brown trucks, or so it has been my experience. YMMV. And somewhere in North America one brown truck is bringing me my b-day present to myself, a nifty new and permanently shiny Ti 29er frame. Yep. I finally bit the bullet...jumped in with both feet...signed on the dotted line...walked down the aisle, as it were. It was not a rash decision though. I really thought this out (about a year) and still I waited till an offer popped up that had the most going for it before I whipped out the plastic. My goodness...I had not bought a bike in about 4 years. I have horse traded for some and ridden a lot of review bikes, some that hang around a while and some that do not, but to buy one for my very own was kinda odd. And I looked at a few more expensive frames. I would love to have a Moots, mostly for emotional reasons going back almost umpteen years, but wow are those dearly priced. There were others but either the fit was out of line or the cost was out of reach. I came darn close to having a very reasonably priced custom built by Form Cycles, but I went for this Lynskey as it had a very good combo of fit, features, cost, and while it may not have the cache' of a Seven or a Moots, it has a high level of quality and a pretty good chance that they will be around long enough to honor the warranty. So the plan is to have this forever, or at least till Armageddon happens and the frame will be recycled into Ti rocket tubing or something, but aside from that I plan on building this up with an eye to what I know works and what appeals to me, even if it is not the lightest or latest. The build may be a bit static as I hope to have it be a consistent ride and not have to try new stuff on it all the time. That will be reserved for other bikes. I want there to be no guesswork when I ride this. I want to get to be old friends. Like those jeans you have had since college or those Vans you just cannot get rid of. No surprises, just welcome familiarity and comfort. Oh yeah, and performance that will make me smile a lot. This frame is a bit of a gamble in that I have never ridden one like it and even at that, this model is a limited run, unique all on its own, but it had a lot of things going for it that I thought made it worth trying out. The fit is perfect for me. Long in the TT and lower in the ST than most XL frames. And I am shorter in the inseam and loooong in the torso/arms. If I had been in the Custom frame ordering mode (and I came pretty close to doing just that) I would have picked those two measurements exactly, a 25" TT and a 20.5" ST. Nice. With a 73* ST angle I will have a roomy cockpit and more seat post extension for a nicer ride seated. The 71.5* HT angle is not perfect for me...I would have slackened it a bit...but it will keep the front center in check and give sharp steering response without being over the top quick. The CS length is a bit shorter and the stays wider at the BB so a 2.3" tire will fit and still be at 17.5" or shorter CS length. Winner. An oversize DT and TT are a gamble, as I do not want to lose that Ti ride, but a Singlespeed makes very high demands of a bike frame in that it has to be able to stand up to high BB loads and even TT loads as you reef on the bars with all that torque being fed into the frame. Ti is not by nature that stiff, so I hope to get a bit of resolve here and not pay too high a price in ride. If this had been a geared bike I would have not done that and would have gone for the more willowy frame build. We shall see if I chose wisely. The only thing that I am not crazy about is the extra braze-on bits that I will likely never use. I would have preferred to have a pure SS frame, but ya never know. Someday I may want to convert it to geared and it will be ready. Not likely though, so there it is...a bit warty in that regard. I am already planning parts...need a fork, got some wheels in the process, need some carbon flat bars too. And maybe next B-day I will get one of those Moots Ti seat posts that are about the sexiest thing ever to go under a bike saddle. Should be a fun build...not a weight weenie deal, just a solid but light all day SS ride. Well I think it a gorgeous frame. Tell you what I like though are the drop outs. They are a great solution for ss. Not really a big fan of track or horizontal drop outs. I have found the typical UPS truck to ride rather poorly and be quite noisy. 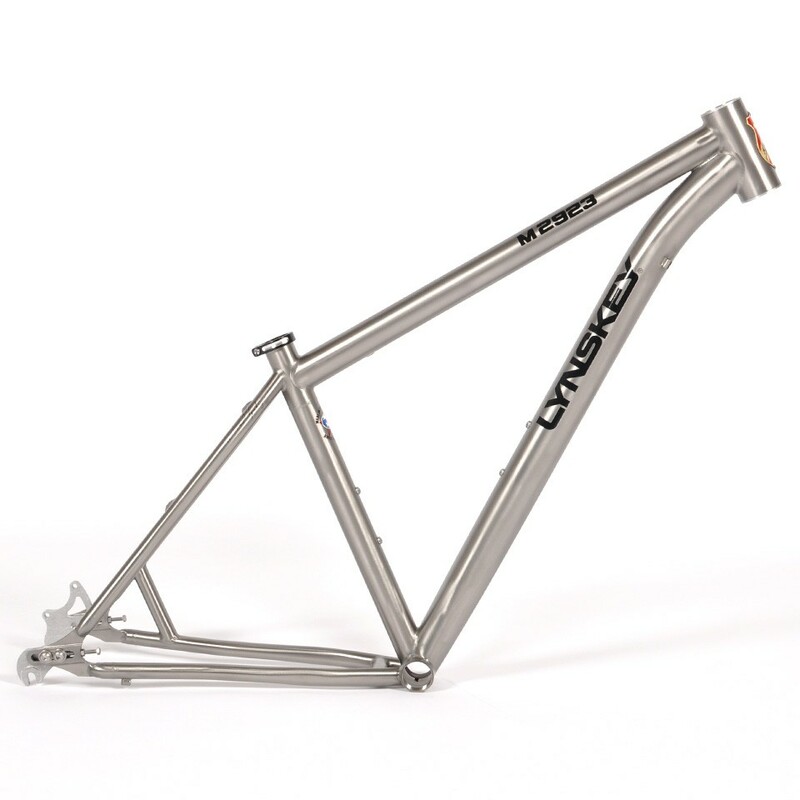 Oh, did you mean the Lynskey? Dunno. Still in transit. Great choice... I own two Lynskey-built frames and both are incredible. You will not be disappointed. What ever came of this frame/build? @Amonymous Keith...funny you should ask. Keep an eye on twentynineinches.com in the next couple of days.